Even though I have no evidence or reference about it, I would say that to wear these masks were men only. Because the dresses are too shabby for women to wear. 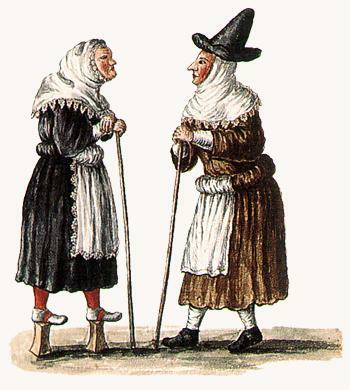 No woman (we're talking noble woman or courtesan) in her sane mind would go in the streets with these clothes on. Where would he seduction be? Same idea as of the gnaga or sposi disguise. Very often, to make these disguises more efficient, the masked guys were taking along children, masked too, so they could have fun together fooling other people. Notice the tall heels on the mask on the left, that were in fashion at the time. Giovanni Grevembroch: "Mascare del secolo XVI"